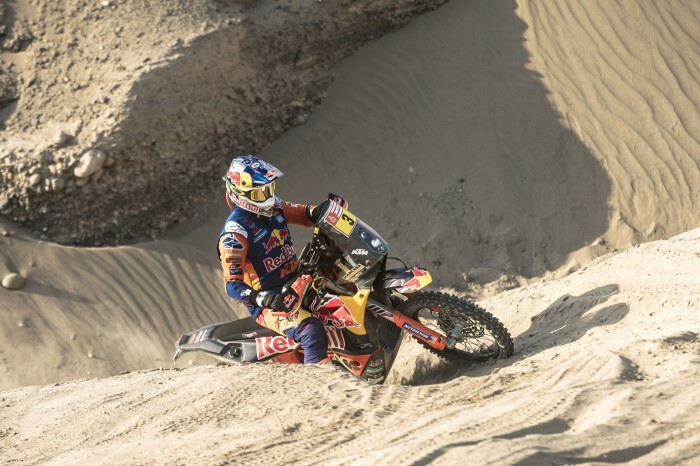 Red Bull KTM’s Toby Price retained the overall Dakar 2019 lead but only has a minute in hand over Pablo Quintanilla. Stage nine of the rally saw another motocross style mass-start with riders setting off in waves of 10, determined by their finishing positions from the previous day’s stage. Heading into the dunes for the 313-kilometre timed special, the first group of riders stuck together for the majority of the stage with Price and Quntanilla corssing the line just seconds apart. “I’d like to finish on top. We’re so close, it’s so tight! We’re all still in with a shout. I know it’s going to be very hard tomorrow, and I’ll give it my best. I know I’m likely to be on the podium tomorrow, and it’s amazing, but I obviously want to win,” said Price.